Interview examines the connection between ancient yoga practices and the science of extended human consciousness. Alex Tsakiris: I wonder if we’re nibbling around at the edges of something that we have to swallow whole. As you mention in your book, Supernormal, and have mentioned previously in this interview, these yogic traditions don’t point to supernormal powers. In fact they go to great lengths to say, “Hey, it’s not about these supernormal powers. Don’t worry about them. It’s about changing your connection and how you relate to—for lack of a better word—God.” If we’re not willing to tackle the Divine then we’re playing a different game but are we playing the game? Dr. Dean Radin: That’s a very good point. It’s true that the yogic path and many of these other mystical paths are basically pointing to enlightenment. Enlightenment is so far away from where science is that it’s probably too far a reach for now. And it’s also true that these traditions say you’re going to bump into these psychic things and don’t pay attention to them because they’re just yardsticks on the way to something more interesting. I would say that from the ancient traditions that advice was probably sound. Well, we’re in the modern age now and what science is able to do is study not the depths of enlightenment but we certainly can study the very place where mind and matter meet. It’s where the deep subjective and deep objective meet, and that is psychic phenomena. So the reason why the book is an entrée into that, it says you know what, science? We don’t know yet as scientists how to go all the way down to or all the way up to the enlightenment but we can begin to go much, much deeper than we have before. And in the process of studying the very area, that very boundary that the ancients would say not to pay attention to, well, we have to pay attention to that. 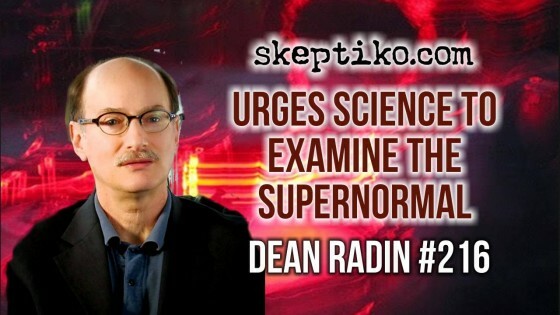 Today we welcome Dr. Dean Radin to Skeptiko. He’s here to talk about his new book, Supernormal: Science, Yoga, and the Evidence for Extraordinary Psychic Abilities. Dr. Radin, of course, is Chief Scientist at the Institute of Noetic Sciences where he’s become one of the world’s best-known researchers on extended human consciousness. His two previous books, The Conscious Universe, and Entangled Minds, were truly ground-breaking and provide the scientific foundation for much of the current interest there is in this field. Dr. Radin, welcome to Skeptiko. Thanks so much for joining me. Dr. Dean Radin: Thanks, Alex. It’s a pleasure to be here. Alex Tsakiris: A lot of people are very excited about this new book of yours, Supernormal. Can you start just by telling us briefly what it’s about? Dr. Dean Radin: Well, one way of getting into the topic is that you may know that the Dali Lama for years now has been having dialogues with scientists on the relationship between Buddhist ideas and practice and science. Primarily physics and the neurosciences. One of the things that you see when you read the transcripts of what goes on in these meetings, and have spawned a number of popular books as well, is that the Dali Lama is very interested in science and the practice of science and what science has discovered. He has said many times that if science demonstrates that something about Buddhist practice or beliefs is incorrect that they’ll change their beliefs and practices. They’re after the truth. So that’s laudable. You would hope then that the same would be true on the scientific side, that if some scientific assumptions turn out not to be completely correct that scientists will correct them, as well. But after reading the transcripts you see that what we’re dealing with is an asymmetry. There’s a lot of interest on the part of the Buddhists on what science has to say but there’s so far very little interest on the part of science on what Buddhism has to say. You see this in stark contrast when the Dali Lama repeatedly tries to bring up issues about reincarnation and about the use of the Oracle and other things that we might consider to be psychic phenomena or related to that. The scientists present usually know nothing about these topics and they dismiss them. They dismiss them in a kind and gentle way so they don’t piss off the Dali Lama but nevertheless they say there’s no evidence so we can go on to other topics. I was just struck with this because for one thing, it really shows that the people that are talking to the Dali Lama are very straightforward, mainstream, very good at what they do, but they don’t actually know what they’re talking about when they dismiss these topics. And in almost every meeting there’s the Dali Lama or somebody else at the meeting who will try to raise well, what about telepathy? What about these issues? And it doesn’t go anywhere. So I was becoming annoyed at watching this year after year and I decided to write a book that looked in more detail at the origins of why the Dali Lama and other people say these things and what’s wrong with science. Alex Tsakiris: Let’s narrow that down a little bit because the title, Supernormal, is kind of a nebulous term. Specifically, Dean, what are you including in that list of supernormal powers in your book? And what did you leave out that could have been left in? Dr. Dean Radin: I’m making a distinction between supernormal and supernatural. Sometimes you see these words used synonymously and they’re really not. Supernatural means “beyond the natural world,” and it generally means that it’s something we would consider to be Divine, not of the natural world. Above and beyond it in some way. Whereas supernormal is ordinary, normal stuff but just super. Bigger. More powerful. More enhanced in some way. So I’m not intruding into the world of the Divine because I wouldn’t know how to study that anyway. But I can look in detail at normal abilities that are super in some way. There’s a similar distinction between the words “miracle” and “marvel.” The word miracle assumes a Divine source. Something happens that cannot be explained through natural means, whereas a marvel is something that’s extraordinary. So the subtitle of the book is Science, Yoga, and the Evidence for Extraordinary Psychic Abilities. That then is the boundary of what I’m looking at. Alex Tsakiris: Tell us a little bit about some of those extraordinary abilities you look at in this book. Dr. Dean Radin: I use yoga and the siddhis, which is a Sanskrit word meaning “perfection” or “attainment,” which is said to occur after advanced meditative practice. These are the special abilities that happen and they’re almost all psychic abilities. I use that path, the yogic path, and I could have used many others and I do mention them. I use the yoga path because it sets out so clearly what the tradition is in meditative traditions on what kinds of psychic abilities you would expect to bump into as a result of practice. They fall into three classes. There’s a class that is exceptional mind/body connections. These are everything from intensely powerful self-healing, like take the placebo effect and multiply it by a few thousand times, to much more radical claims having to do with inedia, which is otherwise called Breatharianism, where you don’t have to eat anything and you apparently live perfectly well, to effects which kind of blur the distinction between mind/matter and body stuff. This includes levitation. It’s the lightening of your body until you begin to hover and perhaps even fly. The opposite of levitation, which is gravitation, in which you become extremely heavy. Then there’s super-speed and super-strength and a whole array of things we associate with superheroes. These are mostly body related stuff. There’s another big class of clairvoyance and the Yoga Sutras which is the classical yoga text. The way that it’s described are roughly 20 different forms of clairvoyance but they all devolve down to the idea that we have access to information that’s either at a distance or hidden or very small or very big that you wouldn’t normally be able to see. Then a smaller class on direct mind/matter interactions in which through thought things will manifest. So you wish to have a diamond and the diamond appears, that kind of thing. So I discuss the full range but in discussing it I also make very clear that because this is an investigation from a scientific perspective, I can really only discuss with any confidence things that have been studied in the laboratory for many decades and has been looked at repeatedly and that we gain some reason to believe that the effects are real. So it really comes down to about four different classes of experiments in which we have very high confidence that some of the original concepts of the siddhis, these special powers, are true. If those are true, then it raises the plausibility that some of the other things that have been described, including levitation and invisibility and all the rest, that some of that may not be completely fairy tales. Even though we don’t have good evidence for it today, maybe at some time it did exist or maybe we have the potential to see those things. Alex Tsakiris: Because as you point out, those things are talked about in a very matter-of-fact way in not only the ancient Hindu and yogic texts but in contemporary accounts of people’s encounters with various yoga masters, right? Dr. Dean Radin: That’s right. Alex Tsakiris: In your book you’re making frequent references to the yogic tradition and meditation. What are your personal experiences with yoga and meditation, both before the book and during the research and the writing of the book? Dr. Dean Radin: I’ve done yoga in one form or another for many years. Not for the past couple of years as seriously as I had in the past. And I’ve also done mediation on-and-off for over 40 years. But when I decided to write a book on this topic, and I looked at the research that is coming out now both on yoga and meditation, the mental and physical benefits of meditation, I decided it would basically be stupid not to meditate. It would be stupid in the same sense that it would be stupid not to brush your teeth every day. As a daily practice that you simply do because it’s the right thing to do, you have to meditate. Now, this doesn’t mean that some people are just naturally inclined, either through temperament or genetic inheritance. They’re very calm and controlled in a sense that they’re not tightly controlled but they don’t worry about things. They’re not anxious. They’re just a calm person. For a person like that, they probably don’t need to meditate too much because the disease of the modern age is stress. So if you don’t find a way to easily control that or do something about stress, it will eat you alive. I tend to be wired tight naturally. I’m a highly anxious person and I can tell a dramatic difference when I’m meditating versus not, just in the way that I feel and how I sleep and all the other things related to going about your daily life. The combination of my past experience with meditation and also taking what I’ve written in this book seriously, I decided okay, I’ve really got to do this. So I have a mediation practice I do twice a day now and have done every single day for the last two years. I plan on continuing it because it primarily makes me feel a lot better. Having read all the rest of the scientific evidence and a lot about the yogic lore, it may go beyond that as well. Alex Tsakiris: In the Introduction to Supernormal you talk about the empirical scientific evidence for these things being overwhelming. You suggest that it’s an opportunity for science to pull itself up by its bootstraps. Tell us what you mean by that, particularly the “pull itself up by the bootstraps.” Why? Why does science need to pull itself up by the bootstraps? So in this case it means there’s a very long tradition, much longer than the scientific tradition, that is not only in yoga but in many other paths as well that basically all say the same thing. If you sit down, you quiet your mind, you pay attention to what’s going on deeply subjectively, then whole new worlds appear. Now, the caution here is that psychologists in the last century spent a fair amount of time with introspection and trying to figure out how the mind works by introspecting. They didn’t get very far with that. I would say that that has dampened enthusiasm in psychology for the idea that you could learn something about the mind and maybe beyond the mind simply by paying attention to what’s going on inside your head, except that the means by which psychologists were using introspection was not the same as what meditators do. So if you follow the original meditative traditions, and of course there are dozens of different meditative styles which may lead to different insights, you find somewhere at the bottom—meaning advanced practice—that they begin to converge in a worldview. That worldview is something that science knows very little about. Probably the deepest look into there at this point has been psi research because we’re looking at this boundary between mind and matter. That’s kind of where these deep meditative practices begin to diverge from what scientific assumptions would say about the nature of reality. So what can science learn about deep subjectivity? I think it has a lot to learn in the same way that science has learned a lot more about deep objectivity than the meditative traditions have. We have something to learn from that tradition, as well. Alex Tsakiris: Okay, but doesn’t science require a kind of closed-loop system that you’re exploding both in this book and your previous books? And if as your hinting at, again in this book and your previous books, that consciousness is somehow fundamental, then why or how can we possibly get there with a science that’s centered around measuring matter? I mean, is it realistic to pull yourself up by the bootstraps when there’s that kind of huge paradigm shift that has to take place? Dr. Dean Radin: Well, when you pull yourself up by the bootstraps it does require different assumptions and perhaps different methods. But science is good at that. Science has developed new methods as new challenges come along. In fact, if we didn’t develop new instruments and new methods we wouldn’t have gotten very far. So the nice thing about science as an open system is that it is flexible and basically limited primarily by our imagination. Ultimately the proof in the pudding is whether people can repeat things independently. But the means by which we get to that stage is not fixed. Alex Tsakiris: Okay, but I still wonder if we’re nibbling around at the edges of something that we have to swallow whole. As you mention in the book and have mentioned previously in this interview, these yogic traditions don’t point to supernormal powers. That’s not what they’re about and in fact they go to great lengths to say, “Hey, it’s not about these supernormal powers. Don’t worry about them. It’s about changing your connection and how you relate to—for lack of a better word—God.” If we’re not willing to tackle the Divine, if we throw up our hands and say we can’t measure the Divine, then we’re playing a different game but are we playing the game? Are we just playing some sideshow game over here? Dr. Dean Radin: That’s a very good point. It’s true that the yogic path and many of these other mystical paths are basically pointing to enlightenment. Enlightenment is so far away from where science is that it’s probably too far a reach for now. And it’s also true that these traditions say you’re going to bump into these psychic things and don’t pay attention to them because they’re just yardsticks on the way to something more interesting. I would say that from the ancient traditions that advice was probably sound. Don’t pay much attention to these strange phenomena because that’s not where you want to go. If we ignore it as well, we’ll never get anywhere. We’ll continue to make things in evolutionary steps and we won’t make big new discoveries about the nature of consciousness. So if we’re interested in the nature of consciousness we need to expand it to exactly in the place where the yogis said not to pay attention to. In the process, I think we have the opportunity to learn something not only new for us but also new for the yogis. You see, the yogis didn’t have theoretical concepts like we do. They didn’t understand the nature of the physical world like we do. So we have the possibility of creating something really new by combining old wisdom with modern methods. Alex Tsakiris: So, Dean, as you’ve pushed this envelope towards extending consciousness and realizing there’s some limits to how far we can go, how has it changed your approach or your ideas about how you would approach this experimentally in your lab? You’ve been doing this kind of research for a long time. How did investigating these yogic traditions change where you might want to go in the future in your lab? Dr. Dean Radin: That’s a fair question. One of the things that you see when you study the siddhis, and this is mentioned in the literature, is the difference between spontaneous psychic phenomena including the effects that we study in the laboratory, as compared to what happens when somebody actually achieves one of the siddhis. So the siddhis, like if you have a siddhi of telepathy or clairvoyance, it’s not weak and sporadic and sometimes appears and sometimes doesn’t. It’s 100%. It’s there. It’s like an ordinary sense and it’s powerful. So obviously I pay attention to that because it would be really nice if we can get somebody to do that in the laboratory. And yet we can’t use somebody from the yogic tradition or one of the other traditions because they’re told not to pay attention to it, or at least not to demonstrate these abilities. I’ve already run up against that with very advanced meditators, who when I ask if they can do some of the siddhis, they just smile. They won’t say anything else. So we’re kind of stuck there. But what we can do and what we have been starting to do in my lab is to use every trick in the book that we can think of to optimize the conditions under which somebody can achieve higher reliability. This includes things like the use of neuro-feedback to get people’s brain states into the right conditions so that they can maintain this, for example, an alpha state where you’re very highly alert but you have no anxiety behind it. That seems to be an important state to be in, of so-called effortless striving. So you can train people to get there and you can train them fairly quickly using neuro-feedback. We can use hypnosis to alter people’s beliefs a little bit. One of the blocks that we see in these phenomena is that you maintain enough doubt that you’re basically self-defeating. Well, if you’re susceptible to hypnosis then that can be changed. You can change, at least momentarily, what you believe both consciously and even unconsciously. We can do tests looking at the difference between your conscious belief and your unconscious belief through what’s called “implicit testing.” There are a variety of ways of doing experiments that reveal how you really feel. How you unconsciously feel about certain topics, including your belief that you’ll be able to do something psychic in the lab. If it turns out that you consciously say, “Yeah, I could do this,” but unconsciously you’re saying, “I don’t think I can do this,” well, we need to know that because that would be a way of discriminating between somebody who’s likely to do better than somebody else. So we’re working down a list of ways that we know of optimizing or suspecting that it would optimize our ability to provide the right concentration, the right motivation, the right belief, the right practice, the right environment for doing the experiments. Everything we can think of to see if we can start moving in the direction of the level of performance that is described in the siddhis as compared to what we normally see, which is sporadic and performance is buffeted all over the place. Alex Tsakiris: Can you tell us a little bit about how that’s coming together in some of your current work? Dr. Dean Radin: Well, our first approach in this direction is in a mind/matter interaction experiment which is not published yet. We will be soon, we hope. What we did is during the experiment, the mind/matter interaction experiment, we also took 32-channel EEG measures and we asked each participant to take a personality inventory called the Cloninger Temperament and Character Inventory. This is an interesting personality test because it assumes that your basic temperament is driven by your biology. The way that you approach the world in fundamental ways is driven by your genetic inheritance. This was developed partially as a result of looking at personality similarities and temperament similarities among identical twins, and it holds up. Your basic temperament is, according to this theory, modulated by what they call “character,” and character is your history. How events in your life have shaped and changed your temperament. So the questionnaire that we give is 240 items. It comes out with different scales showing your temperament and your character. We have the EEG measures. And we have information on how the people did on the mind/matter interaction task. We look at the correlations among these different factors. We’re finding some very interesting things. I’m not going to go into it in any detail because it’s not published yet but the upshot of it is that it gives us a better picture on what kinds of people do well in what kinds of brain states for these particular tasks. That gives us a clue about both who to select and what kind of brain state to be in in order to optimize performance. Alex Tsakiris: Finally, Dr. Radin, I want to touch on one other topic that I don’t think you talked a lot about. You’ve built a solid reputation as a scientist. People look to you for the integrity and the rigor you bring to your work but you also—whether you want to or not—have been pushed onto the front lines of this worldview battle that’s going on. On one hand we have a culture that’s built on materialism, really two kind of materialism. Scientific materialism, we are biological robots, life is meaningless, the universe is meaningless. And an economic materialism that tells us that he who dies with the most toys wins. Given the extent to which we have to acknowledge we’re totally enmeshed in this paradigm, do you really think we can navigate out of it? You’re painting a picture for how we would do that with this book and with your body of research but do you really think that’s possible? Dr. Dean Radin: You mean is it possible given the amount of inertia and economic investment in the status quo? Alex Tsakiris: Economic. Political. Military. Day-to-day. Our technology. We’re enmeshed in it. When we talk about transcending it I wonder if 1) it’s a pipedream; and 2) if it’s something we even want. Dr. Dean Radin: Well, it’s a very good question and I think on alternate days I’m optimistic and pessimistic. The inertia is gigantic. Many people are still questioning as to whether the climate change is real or not, even in the midst of extremely unusual weather. I live in Sonoma County in California and yesterday in Sonoma County there was the longest run of lightning strikes in the middle of the night, almost out of nowhere, for hours. It just stayed in one particular spot for hours and it lit up something like 20 or 30 fires. The newspaper reported someone who’s 80 years old saying he had never even heard of anything like that before happening anywhere. And it never happens to have lightning storms like this in Sonoma County. So we are faced almost daily now with extremely unusual weather patterns and yet when we look at what’s happening in politics it’s as though this is nothing. And it actually doesn’t even matter what the cause is. What matters is it becomes a topic of discussion about what we do about it. Alex Tsakiris: But that’s really problematic because if we look at climate and we look at it scientifically, it’s just another rat’s nest. The biggest news scientifically in climate has to do with both the UN governing body and NASA coming out and saying that in the last 17 years there’s been no global warming. So whether we’re screwing up our environment to the extent that we think we are with CO2 gases, we can put that aside for a second and deal with, by the best measures we have, these models that we were all excited about a few years ago which have totally failed us. They haven’t predicted what we would expect to happen given the variables that have come into it. So I don’t think it’s any surprise that people are stunned into inaction. I mean, which way should we go? Moreover, the whole global warming theme was sold to us wrapped up in a goofy carbon-trading, multi-trillion dollar scam deal that can’t be separated from the science. So again, doesn’t this point to how these things are enmeshed? How science is enmeshed with our politics and whatever else is driving us towards this future that someone is planning? Dr. Dean Radin: Yeah. That’s where my pessimism arises from, because of economic interests and because of people who have money and power wanting to maintain it, which means maintaining the status quo. It’s unlikely that much will change at all. What does push change, at least within the scientific world, is new and exciting theories. Fortunately, a lot of scientists are like myself and we pay attention to what’s going on in the world. What we’re really driven by is curiosity about the natural world, so when somebody comes along with something really cool and interesting it attracts a lot of scientific attention even though we don’t actually know if there’s a practical use for it now. If it turns out that something is developed that has a practical use, then it gains even more attention. There are plenty of people out there who want to make money based on it. So when I’m optimistic I’m thinking particularly if quantum biology continues in the direction it’s going then the plausibility case that could be made for a theoretical underpinning for psychic effects will continually get better. Then people will pay more attention to the data. Ultimately, it will simply become one more interesting and curious thing that science can study, in which case it doesn’t matter what’s going on in the rest of the socio-political context. It’s something that will just naturally be absorbed into science because it’s something that’s curious. Now, that said, certainly the topic is still quite taboo. It’s quite difficult for people to make a living in the academic world if they’re interested in this topic. But historically that’s been true for other topics, as well. Eventually truth will out and it’s simply a matter of more struggle during the times when it’s taboo. That could change and it could change quickly. Alex Tsakiris: Well, let’s hope truth does will out. If it does, I can bet you that Dr. Dr. Dean Radin will be at the tip of the spear. 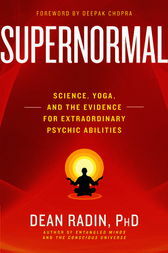 The book is Supernormal: Science, Yoga, and the Evidence for Extraordinary Psychic Abilities. Dr. Radin, it’s been a great pleasure having you on Skeptiko. Thanks so much for joining me. Dr. Dean Radin: Thank you, Alex.